With the help of the Design Thinking method you learn to understand your users and to develop new products, prototypes and ideas from this knowledge. Design Thinking also helps you to make better decisions and prioritize the resulting multitude of great ideas. Our Design Thinking workshop teaches you what you need to know to get started. The complexity of problems and the speed of change are becoming more and more challenging. Agility seems to be inevitable nowadays. But how can we set up an agile idea generation process that allows us to test our ideas on the market and with real customers? How can we learn to understand our users and develop prototypes from this knowledge? And how can we learn to choose between different good ideas? You will be able to answer all these questions after our Design Thinking Workshop. We start by understanding the customers and users, the problem and the status quo. 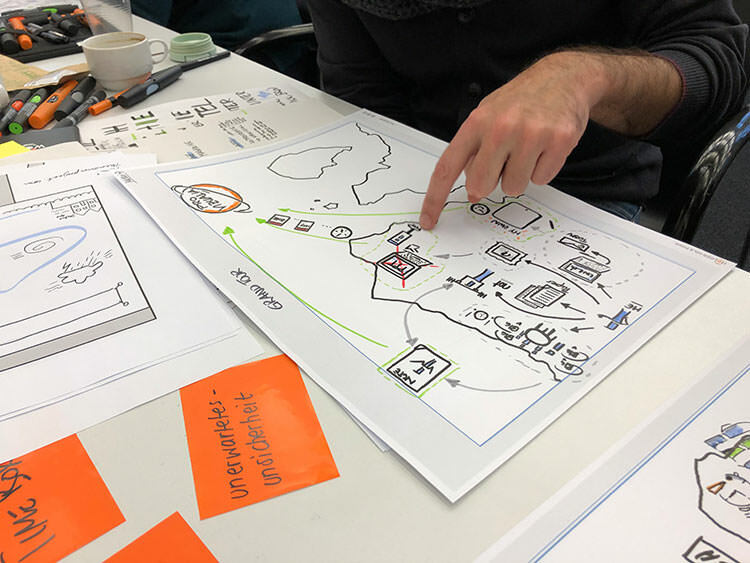 We use Design Thinking to work out how we can systematically develop ideas, prioritize them and convert them into prototypes that can then be tested on the market. Design Thinking is first and foremost a thought model. A possibility to think and work "differently". And yes, design thinking is also a process that you can easily follow. In the future, Design Thinking will flow into all our work areas and change them for the better. How can I learn more about my customers and users in a structured way? How do I develop many ideas in a short time? How do I evaluate ideas? What are the possibilities to convert ideas into prototypes? How do I test my ideas on the market or together with my customers or users? No previous knowledge is required for this Design Thinking Workshop. The only thing you should bring along is curiosity and fun in creative work!